Taoiseach Leo Varadkar has delivered a downbeat assessment of the Brexit negotiations as he arrived for an informal dinner of EU leaders in Salzburg. Mr Varadkar told reporters: "I don’t think we’re any closer to a withdrawal agreement than we were in March. So I can't report any progress at this stage unfortunately, but we’ll keep working on it." 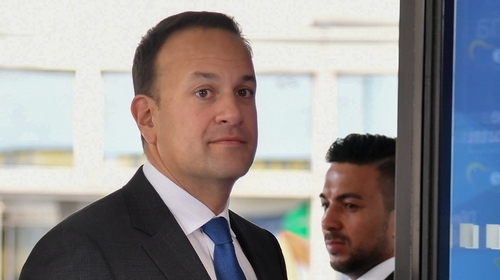 Dismissing suggestions there had been progress in recent weeks on the Irish backstop, the Taoiseach said the UK still had to present an alternative text to the EU's initial draft, which was rejected by Prime Minister Theresa May in March. "We’ve yet to see an alternative text from the United Kingdom government that anybody in the European Union finds to be acceptable, that actually satisfies what we need, which is an assurance that there won’t be a hard border between Northern Ireland and Ireland, and that that backstop would apply unless and until we’re in a position to negotiate a new free trade agreement between the EU and UK." He added: "The Irish position and the position of the European Union is as it has been from the very start. It’s that we want there to be a Withdrawal Agreement, a Withdrawal Agreement that provides for an orderly exit of the UK from the European Union. "And we want there to be a transition period so people can adjust to any changes to the rules of trade that are going to take place." Mr Varadkar said: "But we also have to have a backstop on NI and Ireland, one that assures us that a hard border will not emerge on our island, and that it has to be legally operable, and at this stage unfortunately the UK has not presented an alternative text to the EU text that we find acceptable." Mr Varadkar insisted an agreement in principle on the backstop needed to be in place by the October European Council. "I wouldn’t like to see it run into November or December, because that would create a lot of uncertainty for citizens and for business too." He said the UK would have to move on its position. If not, he said, "I don’t think anybody wants to contemplate a no deal scenario. I don’t believe a no deal scenario is where we’re heading. But certainly Ireland is prepared for it. We’re already started the process of hiring hundreds of people to staff our ports and airports. "We’ve also started to approve the IT systems, the infrastructure that may need to be in place. I want to emphasise that’s for ports and airports on east/west trade. We’re not making any preparations for any form of hard border between north and south. "Ireland would very much suffer in a no deal scenario. We don’t want that to happen. I think the UK would suffer a lot as well. And I think that’s why we need to redouble our efforts to aim to have an agreement in principle in October in the Withdrawal Agreement, on the Irish and Northern Ireland Protocol, and then use the period after that to draft the joint political declaration on the future relationship. "But I think if any sense has been created that any form of significant progress has been made in the last couple of weeks, unfortunately that is not the case." At the dinner this evening, Theresa May is expected to explain further her "Chequers" proposal. But she is also expected to firmly rule out the Commission’s latest suggestions on dedramatising the backstop. Both leaders will hold a bilateral meeting in Salzburg tomorrow morning. Earlier, the Tánaiste has said the European Union members' solidarity with Ireland over the border issue is more solid now than it has ever been at any point of the Brexit negotiations. He said the reason why Michel Barnier was trying to re-write the backstop proposal, while ensuring there was no hard border on the island, is because his team was committed to getting a solution for Ireland and one that the UK can also live with. Mr Coveney was also speaking ahead of the two-day informal European Council summit in Austria. Asked if a deal can be reached by October's summit, the Minister for Foreign Affairs said 90% of the withdrawal agreement was done, and the last 10%, which included agreeing the backstop, was difficult. He said if there was an appetite on both sides to intensify efforts then we could be in a position in October to make serious decisions. However, he said if that was not possible then there was always the option of a summit in November. The President of the European Council, Donald Tusk, has said he would call an additional summit in mid-November to seal any deal with Britain. Mrs May has received less than glowing praise for her Brexit plan in Austria, with Mr Tusk saying Britain must rework its proposals for Northern Ireland and trade. Hours before the British Prime Minister was due to try to sell her plan to the other European Union leaders, Mr Tusk repeated criticism of her proposals for future customs arrangements and for the border on the island of Ireland. Mrs May has shown little sign of backing away from her "Chequers" plan, and repeated her aims in a carefully placed article in a German newspaper on the eve of the two-day EU summit. However, Mr Tusk was clear that her customs proposals and those aimed at preventing a hard border would have to be reworked. Earlier, EU negotiator Mr Barnier signaled he was ready to address Britain's border concerns. "The Brexit negotiations are entering their decisive phase. Various scenarios are still possible today but I'd like to stress that some of Prime Minister May's proposals from Chequers indicated positive evolution in the UK's approach," Mr Tusk told a news conference. "On other issues, such as the Irish question, or the framework for economic cooperation, the UK's proposals will need to be reworked and further negotiated." A British government source said London welcomed the EU's commitment to finding a solution to the border issue, but could not accept any proposal that would effectively move the customs frontier into the Irish Sea, separating Northern Ireland from the rest of the UK. Austrian Chancellor Sebastian Kurz, whose country is hosting the summit under its EU Presidency, called on Britain to be more flexible in the negotiations. "A hard Brexit with no deal would be difficult for Europe, but it would be terrible for the UK," Mr Kurz said.